Laminate flooring is basically inexpensive particle board covered with a photograph of wood grain. Laminate flooring often is installed as a “floating floor” and not securely fastened to a subfloor. This "floating floor" has a tendency to shift up and down as you walk across it. This movement can cause it to become unstable, thereby making it a tripping hazard especially for the elderly and disabled. As they shift back and forth, a floating floor can end up with large gaps that form between floor boards. Excessive moisture, water leaks, or even minor water damage can cause the material to delaminate, buckle, and expand rapidly requiring removal and replacement of the product. 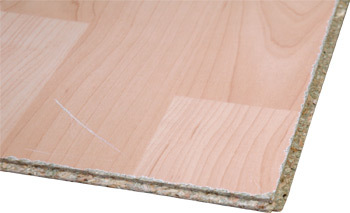 The cheap laminate that covers the particle base can also chip and scratch easily on the edges, leaving the particle board core exposed as illustrated in the above photo. To make matters worse, repairing laminate flooring is often not an option as matching the product at a later date can be impossible. Each production run of a laminate flooring product can vary significantly leaving customers with no acceptable replacement product for any repair areas. Wide range of installation options but some “floating floor” present tripping hazards. Particle board core can retain moisture which leads to numerous problems including delamination and decay. Refinishing is impossible because the top layer is just a photo of real wood. Some foreign manufactures may use toxic adhesives in laminate flooring products. Most laminate flooring fails to mimic the genuine look of a real wood floor. Unreliable particle board base makes laminate flooring less than ideal. Many brands wear down in the long term and will eventually require replacement. Ultimately, the use of Laminate flooring presents a very “fake”and low budget look to the finished project.